Okay let's face it, nail art is not my strong point and I can't help but mess up pretty much every time I paint my nails or attempt any type of nail design, so why am I doing a post on nails?? Well as a beginner/self-proclaimed newbie, I want to reach out to those who may be on the same boat and let them know that it's okay! It's okay because there's help - professional help, haha. Professionals being the wonderful people at nail salons that make the vain life easier and last month I sought this professional help for reasons being that I wanted to have pretty nails and a solution for chip-proof, streak-free nail polish. I decided to leave it up to the experts and they came to my rescue (technically I went to them but you know what I mean). 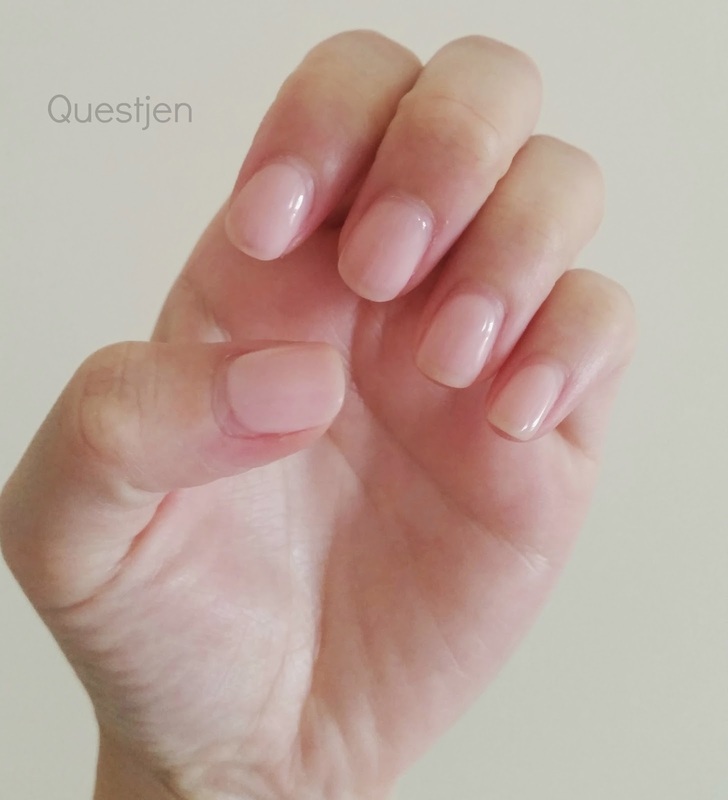 Fellow nail newbies, I'm here for and I'm here to share my experiences with getting my nails done by a professional (only twice but these still count for something!) and give a quick run-down of what I've had on my nails from my very own basic perspective. This is a beginner's nail guide from a beginner (me) to a beginner (you?) and this 'guide' is at the most basic, simple beginner level since I won't be able to explain the processes unless I string sentences like 'the thingy was used for this thing' which will make it seem as though it's the blind leading the blind. I definitely won't be doing that so hopefully my pretty pictures and a YouTube video that isn't my own will solve this problem :) Time to get serious! My nails in the above picture is a combination of full set acrylics and a shellac finish. There are other nail services that can be done such as full set using gel powder and colour glitter powder but seeing as I haven't had these on my nails, I won't be talking about them. Basically the difference is that gel nails look like gel because of their glossy/clear finish and acrylic nails are matte and require some type of polish on top. I would say that these are the most popular types of artificial nails. It's certainly what I hear people get done the most. 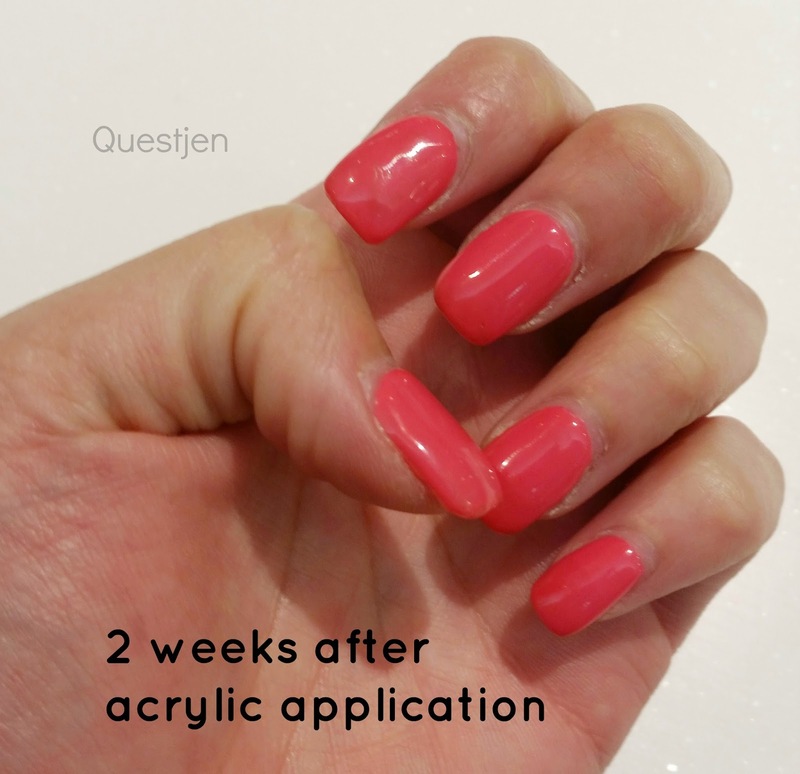 Acrylic resin is a substance (oh my ancient Chemistry knowledge is coming back into action...) used as a lacquer and a nail overlay and is very durable which makes it no surprise that many people get acrylics done to help strength their natural nails (underneath) and prevent breakages. 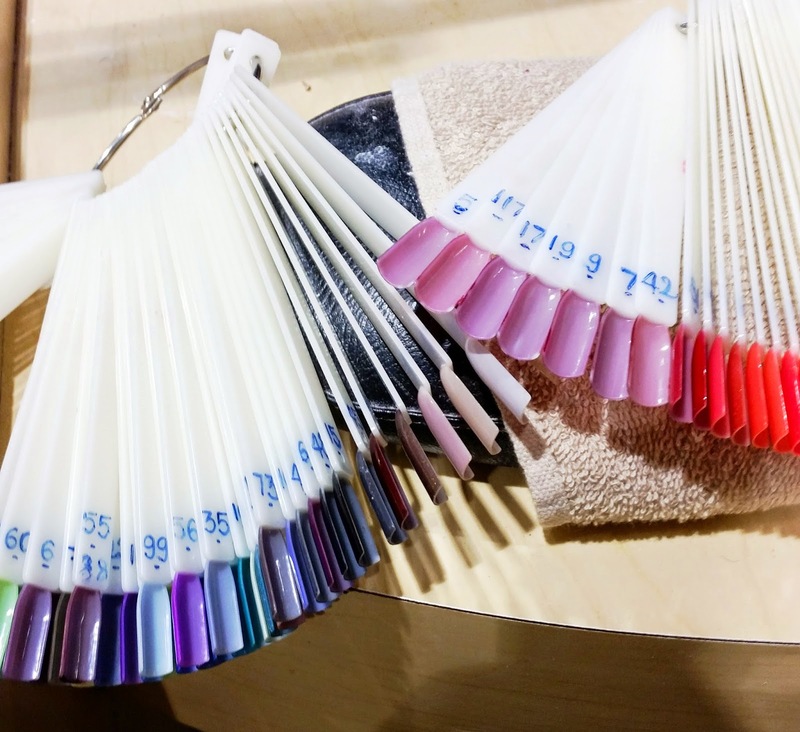 A full set of acrylics applied on the nails means that some plastic tips are applied on first to give the length/structure, then an overlay of acrylic liquid and powder is mixed together to form the base of the nail with the tip. I came across this tutorial on YouTube that shows exactly how it's done. I don't bite my nails nor have issues with the strength of my nails however if the above apply to you, perhaps getting acrylics is a solution for you. 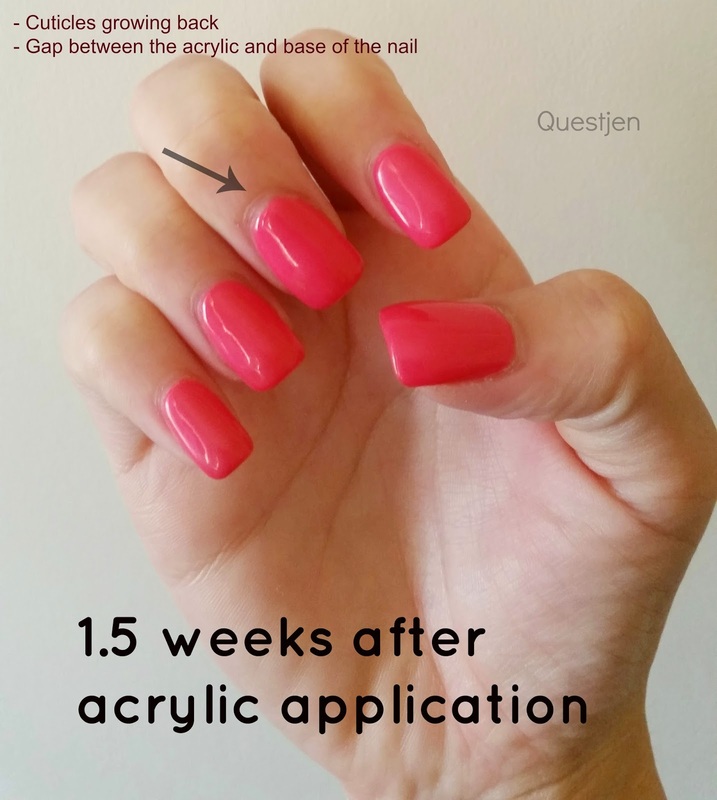 Like I mentioned before, acrylics are very strong, long-lasting and therefore breakages would seldom occur. 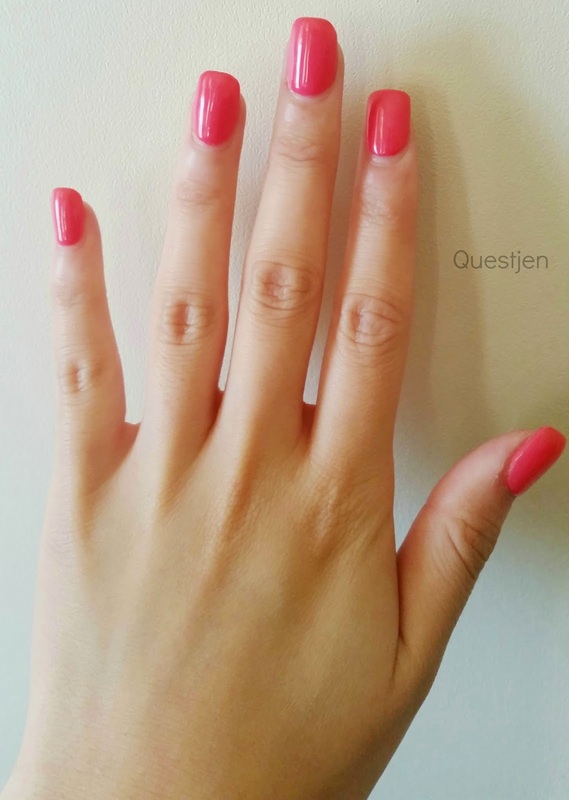 You can pick the length that you want your nails to be and also the shape. You don't need to wait for your nails to grow to the length that you want them to be. I didn't want my nails to be too long and I decided to go for a square shape since I haven't had square nails before. After having acrylics done, you can decide on having a french nail polish for that natural look or any nail colour of your choice. I decided on a pinky-red shade and wanted to give shellac a try since I've heard such great things about it. Shortly I'll explain what shellac is. I loved how shiny and pretty my nails looked and how strong they felt too. It was great having a perfect manicure/nails for once - it gave me confidence and I could easily share NOTD posts without feeling self-conscious which I always have. 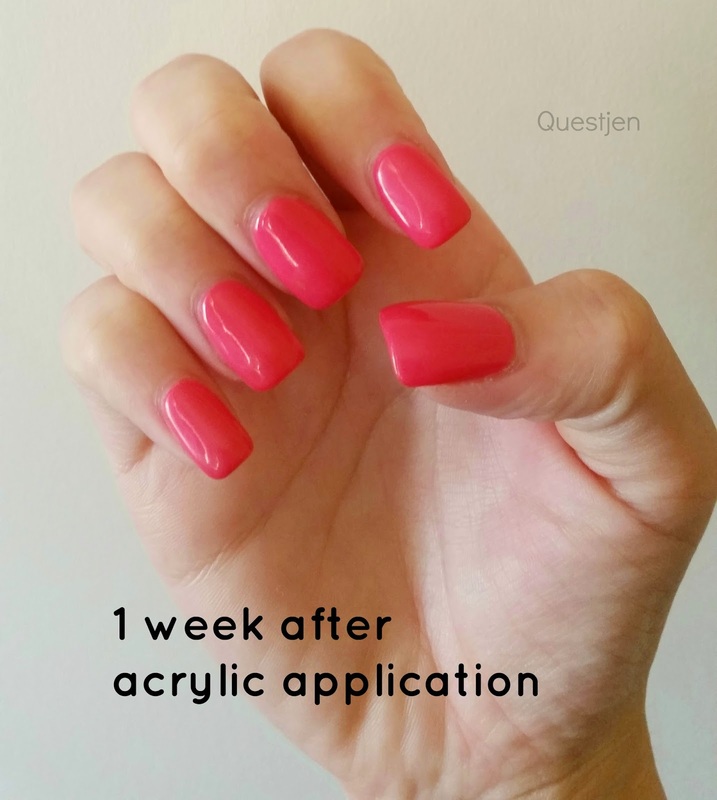 Also it's completely different to having glue-on false nails because with acrylics it's much more difficult for them to 'fall off' as they last 3-4 weeks or more. The full set acrylics plus the shellac cost about $50 and the process together took roughly an hour. Tasks where natural nails come in handy such as scratching (you can never really satisfy an itch with these on when the tips are buffed down to feel more gentle) and peeling/prying open objects weren't the same anymore, in fact I felt as though I was at a disadvantage more than anything! You start getting a gap that gets bigger and bigger over the weeks when your natural nails grow between your cuticle and the acrylic and it isn't very pretty. Also the cuticles that were pushed back/removed grow back too. The simple solution for this is to get 'refills' but that's extra money to be spent and I wasn't thinking of getting that done. 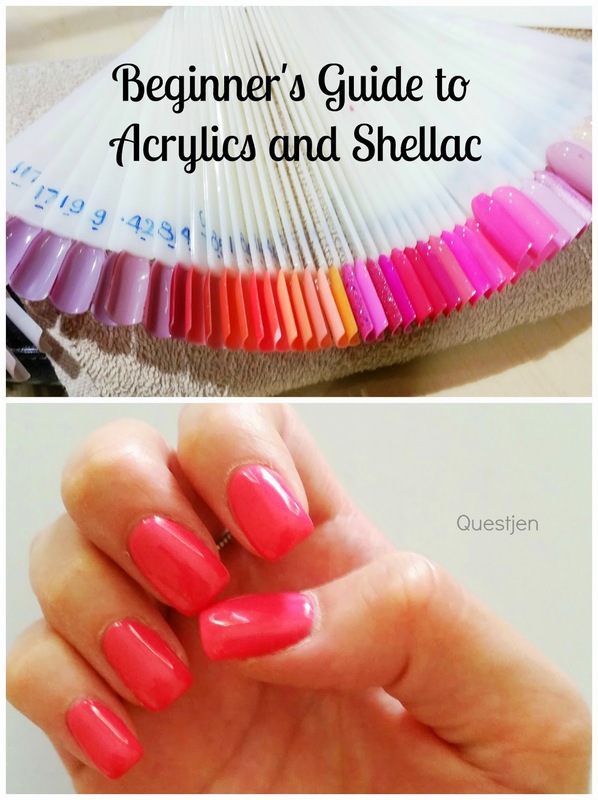 Shellac is an alternative to nail polish, in fact it's made many switch from regular nail polish to shellac. Shellac is a brand of gel nail polish that lasts for a good 3-4 weeks without a single chip and I can definitely vouch for that. It leaves a very glossy finish and it feels very smooth. It lasts long because each coat is dried under a UV light for about 40 seconds to allow each coat to adhere and dry quickly. The process altogether takes about 20-25 minutes costs around the same too, being $20-$25 or so. After removing my acrylics they made sure that my cuticles looked nice again and made my natural nails square-shaped. 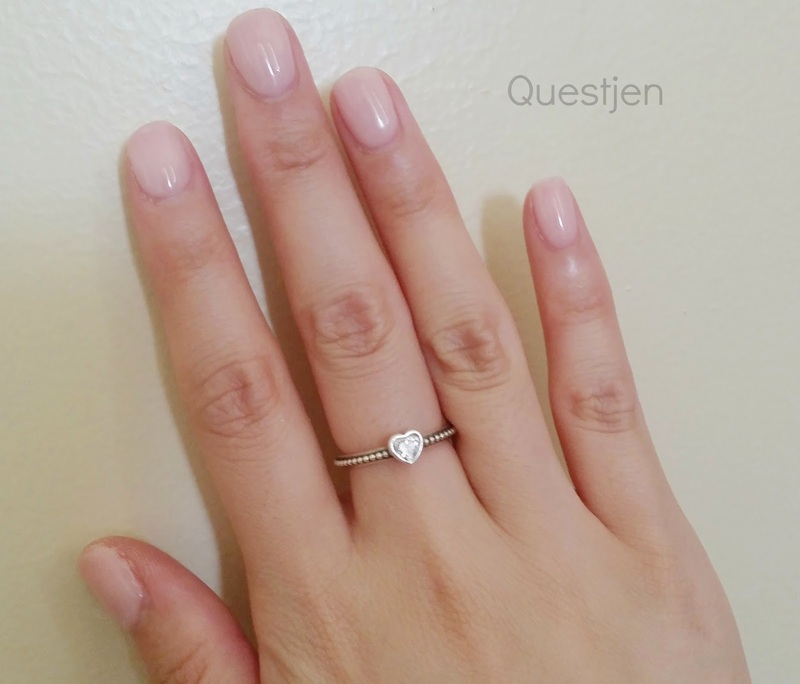 They recommended this shape for shellac application as it gives a nicer look than rounded nails and I agree. I haven't come across any nail polishes that look as glossy as shellac, in fact I don't think there is anything better than shellac with its long-lasting, high-gloss formula! Standard 'gel' nail polishes that I see marketed in department and beauty stores aren't even up to this standard as they chip within days. I could be cleaning, scrubbing etc. and still not a single chip appears on my shellac'd nails. I am amazed and I would definitely go back and get shellac done on my nails :) I recommend it to everyone! With nail growth, the gap between the base of your nail and shellac gets bigger and starts to look as though you're missing half of your nail polish not from the tip of your nail but from the bottom. This can be a bit of a bother for some people, especially if you're like me where you tend to get bored of having the same nail colour on for weeks. To remove shellac, your nails need to be soaked in pure acetone which is known to dry out your skin/nails or alternatively, have them peeled off (I don't recommend this) and/or buffed away with a nail file/buffer which is time-consuming. Instead you'd get it all removed and applied in full again - you'll be paying the same amount as though you were getting it done for the first time. Having to spend $20-$25 every 3-4 weeks might not be so bad for some people but for me I'd rather not have to worry about the upkeep. For now I'm sticking with nail polish and perhaps for a special occasion I'll choose to have shellac applied again, or when I've got more disposable income haha. Overall I had really positive experiences with getting my nails done at a salon and the outcomes of each service. As with all temporary services such as getting your hair/makeup done, it requires an upkeep which ends up being quite pricey if you do the math. For some it's worth it and for others it might not be but I think it's nice to pamper yourself once in a while. Having someone else do something for you that they enjoy while you get to sit back, relax and watch is very enjoyable and even more fun when going along with a girlfriend or two. Have you had your nails done at a salon before? Or more specifically, by a nail professional/expert? Also happy to answer any questjens of your own that you might have! Disclaimer: This is not a sponsored post, nail services were paid for with my own money and I am not affiliated with or sponsored by any nail salon company, although that would be nice. All opinions are stated by me and are 100% honest and free from bias. LOVE that second color you chose! I've been loving neutral colors on my hands lately too. Shellac is godsend when it comes to pedis! i've always hated doing my own pedicure and now I always get shellac done and it's the best!